Funny, somewhat smarter than usual comedy that is entertaining and occasionally insightful despite a typical comedic plot and some lame scenes here and there. The film often feels like a mix of biting political satire and traditional brain-dead “gag” slapstick, with the successful use of the former being the main reason the thing is as good as it is. Some of it is really quite clever, and funny. Don’t get me wrong, though: it’s still a pretty dumb movie. But at least it’s one with a message, and a smart message at that. Mostly. The acting is also pretty good, especially from Zach Galifianakis who manages to pull off the “likeable moron” persona quite well. The guy is underrated as an actor, I think. The woman who plays Will Ferrell’s wife is really good here as well, whoever she is. Katherine LaNasa. Never heard of her before, but man does she nail the role. Here’s hoping she gets to do more stuff in the future. Everyone else is fine, but those two were the real standouts. Story wise, it’s pretty traditional. If you’ve seen the trailers you pretty much know how it’s going to play out. People don’t go into these things for the story, really, they go for the gags, and, to the film’s credit, a lot of the gags are quite funny. 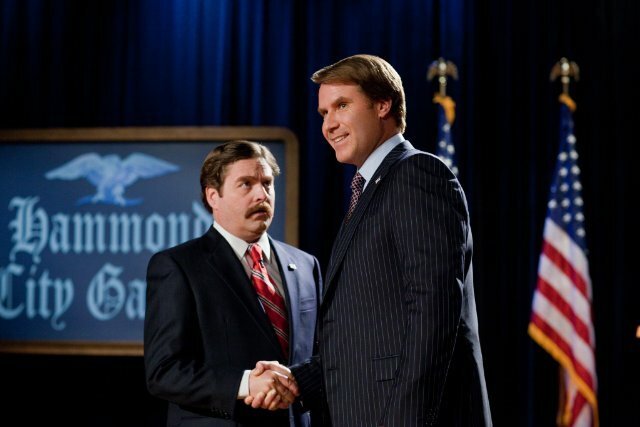 I especially liked the one where **SPOILERS** Will Ferrell and Zach are shaking hands and “trash talking” one another before their debate. **END SPOILERS** Hilarious. And other stuff too. It’s a comedy, people. You know how these things go. Nothing too deep or metaphoric or otherwise meaningful here. Just laughs. And yeah, the film does have a message, and uses comedy to convey that message in an entertaining way, but it’s nothing mind-blowing. Overall, I enjoyed the film. Some parts are a little tedious, and not all the jokes work, but it’s pretty good for what it is: a goofy political comedy. Maybe if it had focused more on the satire and less on the stupid, it could have been something special. But satire is hard, and this film succeeds in getting its point across without it for the most part. Whatever works, I guess. So, yeah, decent film. Funny. Good for a couple of laughs, and a little thinking. Just a little, though.